Switching to the Ch4 since I can get to everything from the main page and it FAST!! Hey Fox2Now, realizing you bought an off the shelf app that you skinned with your artwork was a quick way into the game but this app has become badly BLOATED. 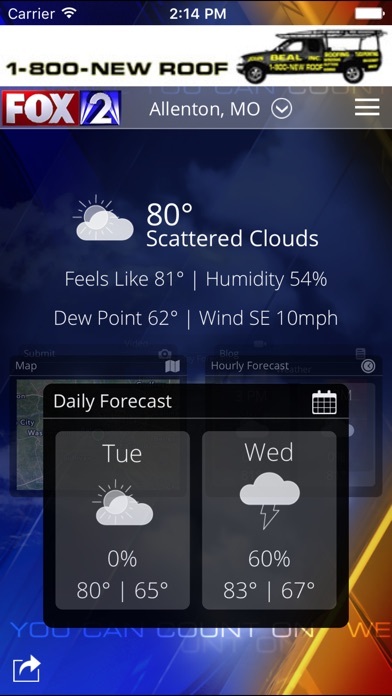 The idea behind a weather app is to provide QUICK access to pertinent WEATHER! Not wait and wait and wait for it to load. Screw the new phones. Make it work well with iPhone 5, not just the new phones. Design and build your own app and scrap the off the shelf cookie cutter crap. After the last 2 updates I can’t get the weather report video to play, so that pretty much makes it useless. I don’t know what happened but if I can’t get the information it’s supposed to provide, why do I need it. Guess I’ll try one from a different channel. I would have given this app a perfect 5 star rating. However, after the app was updated with its most recent update, all of my stored locations that I took the time to actually pinpoint specifically, were erased. It prompted me add if I were using the app for the first time when opening. This, to me, is a huge developer oversight! Please make sure that you code in for a transfer of saved locations on your future updates!! 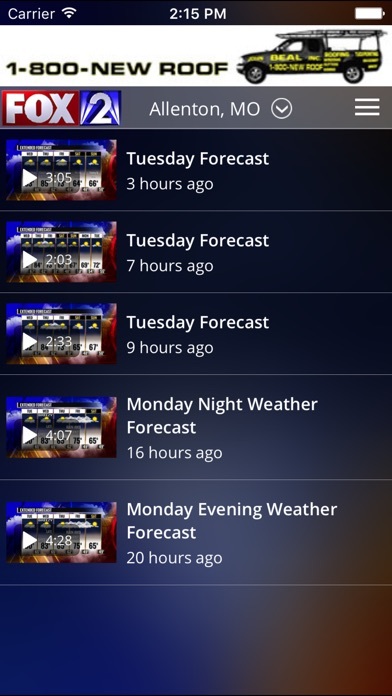 I LOVE my Fox2 app! I look at it everyday to stay up on the news. I would give it 5 stars. However, lately I can't get through reading news stories without being interrupted MULTIPLE times by the pop-up ads. It's extremely annoying!!! I thought at first I was accidentally hitting the ads to make them come up. But lately I've been keeping my hands off the screen as much as possible and ensuring I wasn't touching the ads when I scroll. But that doesn't matter. They pop-up when I'm not even touching my screen. I will give the app 5 stars if you PLEASE STOP THE POP-UP ADS!!!!! PLEASE!! The old version was much better!! Disappointed. Not impressed with this update! Did any of the designers of this app update decide to take their device outside in the sun to see if there are contrast issues. Not helpful for soccer moms sitting out in the middle of green fields trying to see if rain is coming. At least give us the option to turn off the satellite to use a regular map. Seems like every time this app updates, which isn't very often, the user interface become less friendly. First, let me say I commend you for trying to add features in order to compete with some of the more feature-rich weather apps out there. But that's about as good as it gets. It opens to a home screen with only a 2-day forecast (current day & next day). The old UI opened to the current temperature and the weekly forecast. We now have to click on the daily forecast to get to the weekly. An extra step that we didn't have before. On the old UI, we could click a day within the weekly forecast to see the hourly forecast. Now we have to choose the hourly option from the menu or go back to the homepage and click the hourly icon. Again, more steps that we didn't have before. But the worst update of all is the new radar map. YOU DO NOT NEED SATELLITE VIEW FOR A WEATHER RADAR MAP! It's useless. 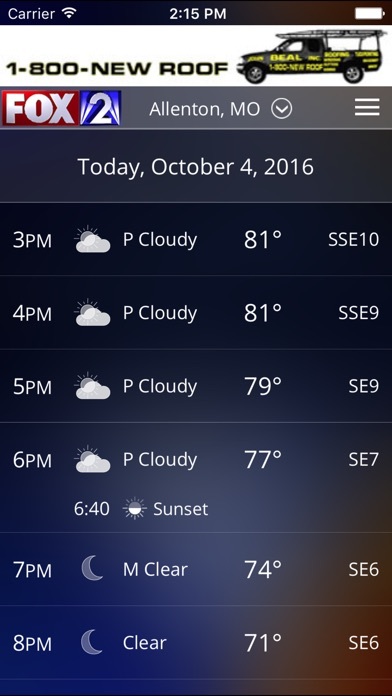 Every major weather app that provides radar either uses the regular map view or gives you the option between map & satellite views. Please update this to go back to map view or give us the choice. Satellite view is slower to load and for those conscious about data usage, it uses more data. Details of satellite view aren't necessary for radar. I love the sleek interface of the Yahoo Weather app, but I refuse to use it because they too only allow for satellite view on their radar map. The weekly forecast screen is cluttered and difficult to follow. So much crammed in with tiny font. All in all, making users do more to access simple features is never a good thing. Overall I find it much more confusing than the old version. And bring back regular map view for radar. Nice that this is a free weather app. But--proves to be a bit confusing as to what features are actually offered free. Almost anything clicked on, lol, takes you to their "store." Ok weather app but I've deleted if because of the stupid red exclamation point at bottom. Makes you think you're going to see an inclement weather alert but it's just a solicitation for you to ridiculously spend ten bucks on some stupid apps. 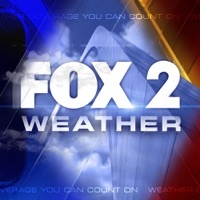 Checking 4 other aps (TWC, My Radar, KMOV, KSDK) and fox's timeline for radar is behind. It's 15 minutes behind. 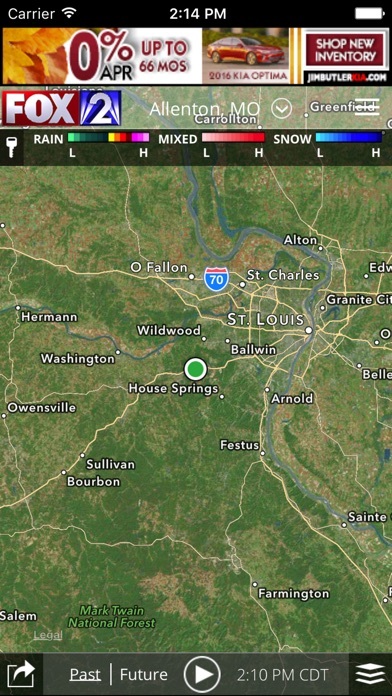 The severe weather has passed is but in the fox app you would think it's just about to hit. The way this ap works is the first listing and image is a over all forecast. Weather past included. Which could be sunny and then when you go to the upcoming eight hours or hourly reading could be thunderstorms. Seems to me if there is eight hours of rain than the first forecast you come upon should state it is raining. Don't really care the ten hours prior to the eight it was clear out. I tried to explain to fox, they were nice and polite in their response, but they did not understand past weather had little effect on why I use a weather ap. I use weather bug now. In the present! Who redesigned this app? Horrible job! The old version could have used a couple of updates but this new version is a major disappointment! Time to find a new weather radar app. The previous version was much better, loaded quicker and was not a resource hog it is now. I hope I don't need to check this if I only have Edge service where I'm at. Also notice that it drains on the battery if you have just closed it and not taken out of memory. (Double circle and then hold icon to get X to completely close it. Please bring back old version!!!! No matter how you try to look at it nothing is better about this app, it is completely ruined. Took the best things about this app and turned it into the basic weather app on my phone. I'll no longer will use it. Like the new look but much different then I remember before the update.....mainly the HAVING TO UPGRADE FOR $9.99 to be able to get LIFE SAVING weather information!!!! Please quit being greedy and do the right thing!!! All the reasons I used this app are gone. Now I'm left to search for one that will give me the features that used to be there. Hour by hour is gone. Easy access to radar, warnings etc are gone. Now they want me to "upgrade" for $9.99?? No thanks. Not impressed. 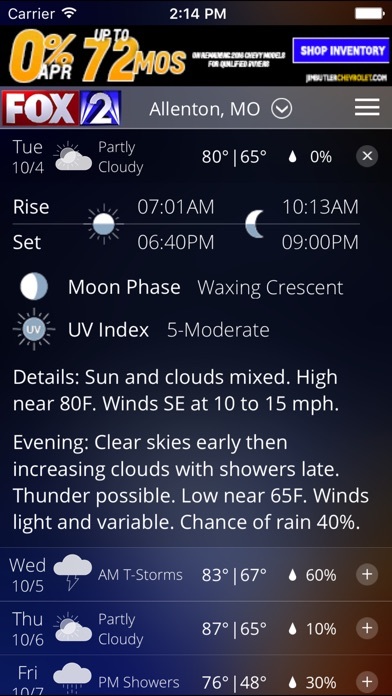 I wanted this app to view previously recorded weather forecast. No option to do this was available. You can watch news videos though. Since it doesn't work for what I wanted I deleted it and went with another local stations app that does. Good, when it works. Slow at times and often won't load at all, other times will load but then crashes. Works well. I like it. Have to constantly re start my phone to get it to connect to the server. It was too slow when loading. The app is pretty good, although it definitely runs slow at times and seems to lock up during big storms. Would love it if the pollen/allergy counts could be added. Nothing special about this app that all the others don't do better. I love this app. I use it the most out of my 5 weather apps. The only problem though is that whenever the wifi signal is bad, it crashes so many times that sometimes I give up. I think this gives the best weather info but it crashes constantly. Sometimes it tales 5 or 6 tries to get it to open. When there's severe weather, I don't want to have to keep trying to get it to open. Also the front page with the temp seems to only update once an hour. I have no issues with finding cities and towns all over the country, even keeping them as favorites to be able to check on my friends when they are under severe weather. This would be the best weather app if it would not crash and update the temp more often. Nice when it works. Doesn't update warnings in a timely manner. My Radio Shack weather alert went off a few minutes ago and still no alert update. WeatherBug already showing warning. Use WeatherBug. Constantly crashes & doesn't load. Needs update badly to fix these issues. Love it when it actually works! This is a good app I would recommend it to every one who wants a weather app! The best for local weather!!!!! This is a very decent app. Everyone giving it bad reviews because it won't load their location are apparently not familiar with how to do that!!! TWC app has been crashing constantly. Accuweather ruined their app. This is a pretty good alternative. Have no issues with this app. Simple weather reports and a radar. That's all I need. This app isn't worth downloading. I can't get it to change to my area. I really don't care about the weather in other places. I want a forecast for where I live. Save time and get the weather channel app. It offers much better info than our own local app. If your going to put an ad bar in an app, you should show it in your screen shots and not try to hide it.